The season for swimming has arrived! Don’t be afraid to don your bathing suit, Gorgeous! ​Many women feel self conscious when baring their bodies at the beach or pool. At Aunt Be Botanicals we want you to FEEL BEAUTIFUL, inside and out! So please try our Cellulite Buster Kit, and don’t hide behind your towel. Everything is made with the highest level botanical actives, listed here so that you know what our ingredients can do for you! Be Treasured Seaweed Soap – Seaweed stimulates circulation and flushes out bodily toxins, which results in a more svelte profile. Goat milk calms irritation, and makes your skin smooth and moisturized. 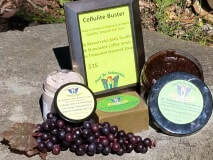 Be Resourceful Body Cream - with Aglianico grape skins. These skins are a natural source of Resveratrol, which is an anti-aging ingredient, is also known to reduce cellulite deposits. Get Relief from Itchy Summer Beards! Juice all the ingredients. Berries are high in vitamins A, C & E. I remove the stems, juice the berries and save the pulp and eat it later for fiber. Juice all the ingredients. (Alternate soft ingredients with firmer ones). Carrots are high in A, a vitamin helpful in maintaining skin cells, as well as beta-carotene and antioxidants that help prevent skin damage. Spinach contains high levels of beta-carotene, which offers free radical protection and converts into vitamin A in the body. It also has vitamins C& E. Apples are great for smooth skin and are rich in beta-carotene and vitamin C. Celery is rich in magnesium, iron, chlorophyll, folic acid, C and also has B vitamins and vitamin E.
Cucumbers are known to be beneficial to the skin when consumed and when used topically. Cucumbers are rich in silica, important for the complexion and skin elasticity. Try to buy organic cucumbers for juicing, so that you can juice with the peel on. Most of the silica is in the peel. If you can’t buy organic, remove the peel before juicing. Juice ingredients. Romaine and other dark leafy lettuces are rich in chlorophyll and a good source of silicon and B complex vitamins. Parsley stimulates the digestive enzymes and cleanses the kidneys, liver and urinary tract. Ginger is good for digestion, but also gives the juice a nice taste. Juice ingredients. Oranges are a source of vitamin C.
Juice ingredients. Cabbage contains beta-carotene, vitamin C and selenium (which slows the aging process and encourages healthy skin). Fruits and vegetables can be contaminated by pesticides. If possible, buy organic apples, celery, strawberries, lettuce, spinach and cucumbers. If you can't get organic, peel the skin when possible. Anti-Aging Properties: Lemon is full of natural antioxidants. It can effectively combat damaging free radicals and remove them completely from your body. Being a good source of vitamin C, the fruit also repairs the damaged skin cells as well as helps you get rid of fine lines, blemishes, wrinkles, deep furrows etc. Hence, lemon water is considered as a great anti-aging solution. Helps Clear Skin: Apart from free radicals, lemon water also purges toxic materials from your blood and keeps the skin clear and radiant. Vitamin C of lemon plays a key role in rejuvenating the facial skin internally so that you do not ever develop age spots and can stay young forever. Lighten Acne Scars: Regular intake of fresh lemon water is also known to help with acne, blackheads and all such skin infections easily. You need to drink it on an empty stomach in the morning. The astringent properties of the mixture are also important for fading out facial scars. Have you heard of Coconut Oil Pulling? Try this for Acne and Eczema! How does this HELP Acne and Eczema? Oil pulling is not traditionally done with coconut oil; however, the benefits of oil pulling with coconut oil are even better than oil pulling with other oils. In addition to the wonderful health benefits in coconut oil, it tastes much better straight than many of the other edible oils and is easier to do an oil pulling with. Coconut oil, especially unrefined coconut oil, has a light coconut flavor that most people find enjoyable. When using oil pulling coconut oil the procedure is done the same way as when any other edible oil is used. The oil pulling coconut oil is swished around in the mouth for 15-20 minutes to help draw out harmful toxins and then is spit out. The mouth is then rinsed thoroughly with water. The oil pulling coconut oil should never be swallowed as it contains all the toxins it has drawn out. One of the best coconut oils to use for oil pulling is Organic Extra Virgin Coconut Oil which is 100% USDA certified organic, and is cold pressed, unrefined and virgin. Better yet, try the same idea and create a daily ritual while still eating a healthy and clean diet. Hot Distilled Water (like you're going to have tea, but without the tea bag. Squeeze half a lemon into your cup. Add 1/4 teaspoon cayenne pepper. This is a great way to balance the alkalinity and acidity in your system. Great for people suffering with acne and eczema as well. There are many health benefits of honey and cinnamon but it is important to know which kind of each should be used for specific purposes. There are basically two types of cinnamon! The first one is called Cassian and has a high amount of Coumarin which could possibly cause liver problems if taken in large doses. The second one is called Ceylon and is best used for medicinal purposes! When it comes to honey it’s hard to know which one to use even if you are just going to add it to a cup of tea. Anyways, you should use only raw one which means it has not been heated up! The best place to find it is at a health food store or Farmer's Market. You’ll probably be able to find the Ceylon cinnamon there as well. Here are some ways that combination of these two very powerful foods can help. Each part of this natural combo has the ability to lower your cholesterol levels on their own. When you combine them, it just doubles the effect! It was found through a double-blind study that participants who had type 2 diabetes and took from 1 to 6 grams of cinnamon were able to reduce their total cholesterol level along with their bad triglycerides. Honey was shown to improve the entire cholesterol panel and even helped participants with type 2 diabetes regulate their blood sugar. Daily Dosage: Recommended amounts for maintaining cholesterol under control are up to 3/4 teaspoon of cinnamon daily or 1/2 teaspoon of its oil 3 times a day. You can combine that with up to 5 tablespoons of that golden miracle made by bees throughout your day! This combination has been found to manage the pain caused by arthritis. There are people who have identified this combination to provide a relief from pain they have had for years! It could be the anti-inflammatory properties of each item that cuts down the pain. Recipe: The suggested dosage is one cup of hot water combined with two teaspoons of honey as well as one teaspoon of cinnamon. You should consume this mixture daily both in the morning and evening as well. This awesome combination of foods can improve your digestion, alleviate gas & ease stomach pains. Just a mixture of 1 tablespoon of honey and 1/2 teaspoon of cinnamon in a glass of warm water is all you need. Make sure to mix it up well and drink it on an empty stomach. You never know when an upset stomach is going to hit so make sure to keep these ingredients in your cupboard all the time. Both have a very long shelf life and won’t go bad anytime soon! The use of this amazing combo for reducing hair loss is a topical treatment as it might help increase the blood circulation in your scalp, which could result in more hair growth. Paste Recipe: You need to make a paste with one tablespoon of honey, one teaspoon of that awesome spice and some warm olive oil. Mix together and apply it to your head. Leave it on for about 15 minutes then wash the mixture out. Many people have found that taking about a half tablespoon of honey in a glass of water with a little bit of cinnamon sprinkled on top can build up your vitality in about a week. The honey will give you a nice little boost without raising your blood sugar levels. And you won’t have to worry about a jittery feeling like you would get from coffee. Just keep a container of this aromatic spice and a jar of that yellow sweet stuff at work and you can sip on a nice cup of tea in the afternoon. You’ll definitely feel refreshed! When it comes to the common cold we’ll try just about anything when we’re sick. Next time you are down you might want to try a teaspoon of raw honey with 1/4 teaspoon of cinnamon twice a day for the first three days. It has been said to knock out a cold especially if you start this procedure when you first begin to feel ill. Both ingredients have anti-fungal, antiviral and antibacterial effects so it shouldn’t hurt to give it a shot. Consuming this sweet and spicy mixturecan help people who suffer from type 2 diabetes. The latter one from this combo has long been recognized for reducing blood sugar levels and honey has been found to have the same effect! You can add both to your oatmeal in the morning and to a nice cup of your favorite hot tea as well! Benefit #8 – Helps Maintain Healthy Heart & ArteriesIt has been found that taking this awesome combo on a regular basis along with proper diet and exercise can prevent heart problems by helping to clear clogged arteries! Just incorporate both raw honey and Ceylon cinnamon into your daily diet! Your body and your heart will thank you soon! Honey has many healing properties that affect the skin. One such combination might help your pimples fade away within a week or two. Take 3 tablespoons of honey together with 1 teaspoon of cinnamon powder. Make a paste and then apply it to your pimples at night before going to bed. In the morning wash your face as you normally would. Repeat each night until your pimples are gone. You could worry that honey might have the reverse effect when using it for weight loss but don’t worry, it has a healthier glycemic index than regular white sugar. A combination of 1 tablespoon of organic honey with 1 ts. of Ceylon type of that aromatic spice can help you drop some pounds. Boil some water then pour it over the cinnamon in a cup. Let the mixture steep for about 15 minutes then add honey. Drink a half glass of it in the morning and second half in the evening before going to bed. Benefit #11 – Reduces Bad BreathJust the simple combination of one teaspoon of each of these vital foods could keep your breath fresh throughout the day. Combine the mixture with a glass of warm water and gargle with it for the full benefits. You still need to clean your teeth on a daily basis! Each of these nutrients has antibacterial qualities and is effective in taking care of many bacterial infections as well as fungal ones too. Ringworm and eczema have both responded well to this kind of home treatment. Combine the two and mix them to create a paste. Apply it topically and you will be surprised to see how quickly your infection will begin to fade. Many of these remedies have been around for hundreds of years. During times when there were no pharmaceutical companies creating new drugs on a regular basis people had to come up with their own natural solutions, ointments and tonics to help treat their problems. Honey and cinnamon have been around for ages and when you combine the right type of each ingredient, you might find that PERFECT home remedy for your problems. One in every four sunscreens in this year’s database is a spray. People like sprays because they’re easy to squirt on squirming kids and hard-to-reach areas. But they may pose serious inhalation risks, and they make it too easy to apply too little or miss a spot. The FDA has expressed doubts about their safety and effectiveness but hasn’t banned them. As long as they’re legal, sunscreen manufacturers will make them. One eighth of the sunscreens we evaluated this year boast SPFs above 50+. SPF stands for “sun protection factor,” but that outdated term refers only to protection against UVB rays that burn the skin. It has little to do with a product’s ability to protect skin from UVA rays, which penetrate deep into the body, accelerate skin aging, may suppress the immune system and may cause skin cancer. The worst thing about high-SPF products is that they give people a false sense of security and tempt them to stay in the sun too long. They suppress sunburns but raise the risk of other kinds of skin damage. The FDA is considering barring SPF above 50+. Half of the beach and sport sunscreens in this year’s guide contain oxybenzone, an active ingredient in sunscreens. But it penetrates the skin, gets into the bloodstream and acts like estrogen in the body. It can trigger allergic skin reactions. Some research studies, while not conclusive, have linked higher concentrations of oxybenzone to disorders, including endometriosis in older women and, lower birth weights in newborn girls. Nearly 20 percent of the sunscreens and SPF-rated moisturizers and 13 percent of SPF-rate lip products in this year’s guide contain retinyl palmitate, a form of vitamin A. Night creams with this chemical may help skin look more youthful. But on sun-exposed skin, retinyl palmitate may speed development of skin tumors and lesions, according to government studies. Why does the FDA allow this “inactive ingredient” in sunscreens intended for use in the sun? The agency has been studying the chemical for years but hasn’t made a decision. We have. The definitive study may not have been done, but we think we know enough to believe you’re better off without sunscreens with retinyl palmitate.